Published on Tuesday, November 20, 2007. This article appears in the December/January 2008 issue of American Craft Magazine. Matthias Pliessnig talks fast, as if to keep up with a rapid flow of ideas. Movement interests him, whether it's flight, the way a boat cuts through water or the physics of how a seat responds to its sitter. Recently the 29-year-old sat still long enough for a conversation by the shore of Lake Mendota ("I come here all the time," he says. "I just got bitten by a duck") near the University of Wisconsin-Madison, where he's pursuing a graduate degree in furniture design/sculpture. He spoke about his life and work so far, which "definitely includes movement." Pliessnig was born in New Orleans to a French mother and Austrian father who emigrated from Europe to work in the hotel industry; they split when he was 11, and the family moved frequently. Growing up (in Texas, New Jersey, Pennsylvania, Colorado, Nebraska), he was interested in aviation, drawing and "the insides of things, how they worked. I liked taking apart my sister's Walkman." 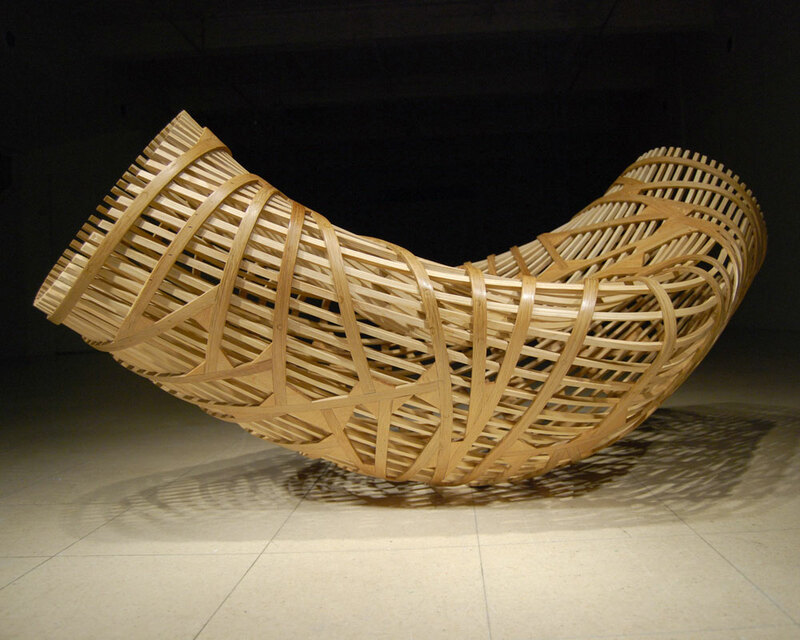 He studied sculpture and design at Kansas City Art Institute, then transferred to the Rhode Island School of Design's furniture department, where he got excited about woodworking and the idea that "the building process is part of the design process." Post-RISD he briefly had a shop in Providence, doing commission work for architects while occasionally exhibiting his unique pieces. He also developed "a major fascination with boats." Luckily there are lakes in Wisconsin. Last summer Pliessnig built and sailed his own 35-pound, translucent boat constructed of wood strips and covered with fabric, an experience that inspired a new direction for his furniture. 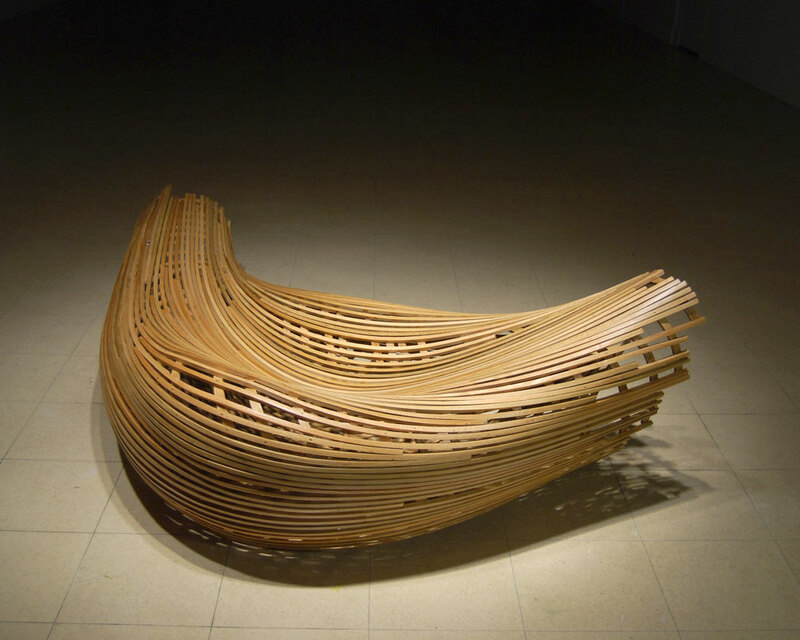 Using thin, steam-bent strips of ash and oak constructed into undulating, geometric networks, he's created a series of dynamic, curving seats that fit the natural contours of the body. Though they're sturdy, there's a pleasing sense of flexibility about the pieces-something we don't normally associate with furniture made of wood. As he preps for his M.F.A. show and graduation in the spring, Pliessnig is feeling restless again. He wants to explore making "furniture that interacts with or amplifies architecture." In the studio he's already moved on, using the pliable wood strips to make sculptures that are organic drawings in space, "like hand-forming clay, totally improvisational." He's in a sculptural interlude, learning a new language for the material; eventually he'll "bring it back into furniture." Watch, and try not to blink. Virginia Gardiner spends a theoretical day at the beach with furniture maker Max Lamb and his Pewter Stools cast in sand and also learns a thing or two about his new Poly Chairs. Passion animates Dubhe Carreño's voice when she talks about her gallery, opened in 2004 in Chicago.